If you’re planning to do some hacking with CPLD or FPGA chips you’ll need a way to program them. JTAG is one of the options and here’s a cheap method that uses the serial port (translated). This method requires only four signals (TDI, TMS, TCK and TDO) plus ground. But the problem is that an RS232 serial port operates with 12V logic levels and the JTAG side of the programmer needs to operate with the logic levels native to the device you’re programming. Commercial programmers use a level convert IC to take care of this for you, but that doesn’t mesh with the cheap goal of this project. 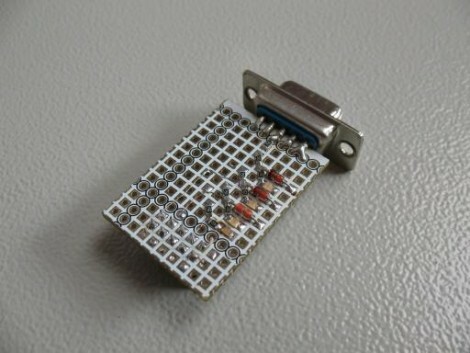 Instead, [Nicholas] uses Zener diodes and voltage dividers to make the conversion. There is also an LED for each data signal to give some feedback if you’re having trouble. You can use this along with a programming application that [Nicholas] whipped up using Visual Studio. It works well via the serial port, but he did try programming with a USB-to-Serial dongle. He found that this method slows the process down to an unbearable 5-minutes. Take a look, maybe you can help to get that sloth-like programming up to a manageable speed. Psst…wanna buy a laser cutter, but not ready to sell your internal organs? 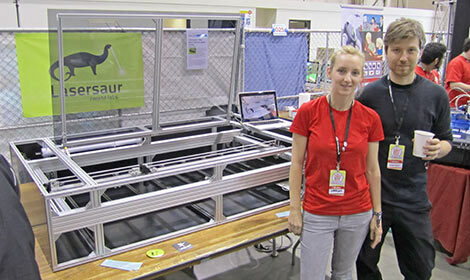 Nortd Labs’ Lasersaur project aims to create an open source large-format laser cutter/engraver that undercuts (har har!) the cost of commercial models by an order of magnitude. [Dino] is staying true to his goal of hacking one project every week. This time around, he’s working on a toy that will amuse and delight his cats. 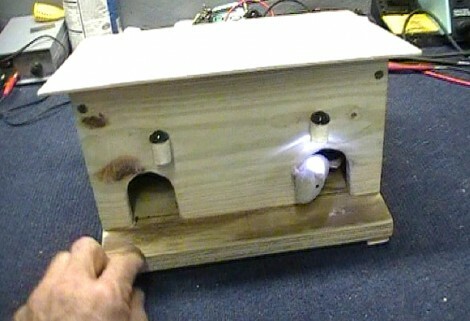 The project centers around a mouse house that has two holes where mice can stick their heads out. 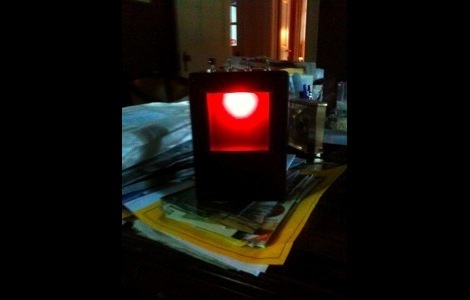 When they do, a little LED lamp illuminates their appearance in hopes to catch the eye of your lazy kitty. 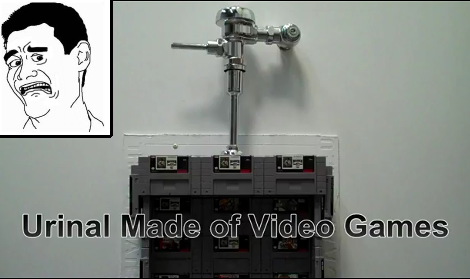 The mechanism that automates this device is quite clever and reminds us of the most useless machine. That is, the armature that holds a mouse on either end actuates a limiting switch in the middle of the box when it moves to expose one of the mice. Each of those mice is attached with a rod, along side a leaf switch that makes the mouse retreat when boinked on the head by the cat. It only takes [Dino] about six minutes to walk us through the build in the video after the break. What follows is a walk through of the wiring and some playtime with the family pets. Despite the intended purpose, it looks like the dog is much more interested than the cat. Either way, it’s a winner in our book. In the early 80s, millions of terminals were handed out to French telephone subscribers. Nearly 9 million of these Minitel dumb terminals were in use at one time, and with that degree of ubiquity, we’re surprised we haven’t heard of them before. These boxes were usually connected to the outside world through their internal 1200bps modem, but [O. Blt] came up with this build (Google Translate link) so he could connect to a local machine with an RS-232 port. After digging up the pinout for the Minitel’s DIN-8 port, [O. Blt] designed a little board around a MAX232 chip scavenged from an old motherboard. Of course there was a need to get the terminal to do something, so [O. Blt] used the Minitel as a display and remote control for Winamp. The project was successful, but not very useful – at 1200 bps, the refresh is very, very slow. 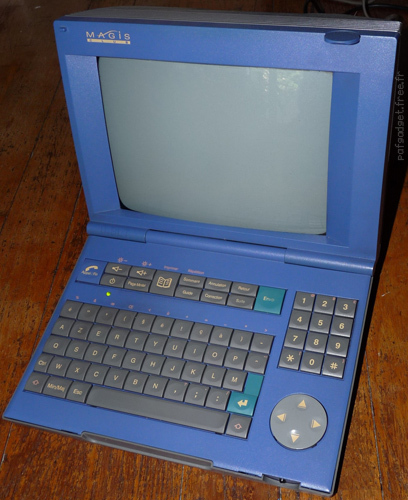 American readers may remember connecting to the Minitel network with their Apple ][s and C64s with CommunityLink, but this service was driven out of the market by the giants of pre-web dial-up, Prodigy and Compuserve. In any case, after seeing the AZERTY and alphabetic keyboard layouts of these old boxes gives us a feeling of nostalgia for a time before everything dealing with computers was standardized.